How much is the Noise reduction of Acoustic Vocal booth? 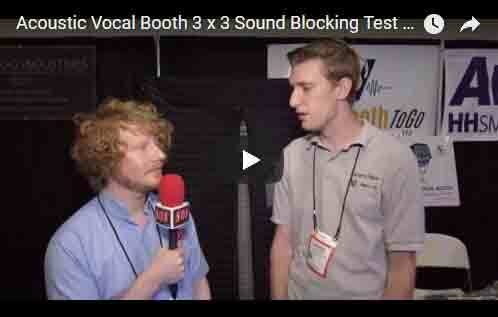 This video demonstrates the soundproofing capacity of the AVB33 – Acoustic Vocal Booth. We tested it at the 2016 Summer NAMM show. Acoustic vocal booth primary purpose is to cut down on echo and reverberation for clear audio recording, but they also reduce the noise level. In this video it is demonstrated that the AVB33 blocks approximately 10 dB of noise. This entry was posted in Acoustic Mobile Vocal Booth, Acoustic Product Reviews and Testimonials, Uncategorized and tagged acoustic room treatment, audio recording, audio recording from the road, Carry-on vocal booth, Most efficient portable vocal booth, portable vocal booth, roadside voice over recording, sound booth, vocal booth, Vocal booth portable, voice acting, voice over, voice over recording while travelling, voice over travel, VOMO tour.